The Risk Report is a copyrighted subscription database created, owned, and maintained by the Wisconsin Project on Nuclear Arms Control. The Risk Report is the Project’s principal vehicle for helping governments and companies manage strategic trade. The database was first published in 1995 and it is now used in some 40 countries around the world. Through their subscriptions, Risk Report users directly support the Project’s research and its mission. The Risk Report logo uses a boomerang to symbolize the expression: “What goes around comes around.” This expression aptly represents the Wisconsin Project’s mission of helping responsible suppliers (both government and industry) prevent their sensitive technology from contributing to proliferation. By exercising care with what is exported (what goes around), exporters avoid supporting a WMD or missile program that could one day target them (what comes around). During the 1990s, the United States and other supplier countries began applying “catch all” controls, requiring exporters to seek a license to sell an unlisted item if they know or are informed that a potential customer is connected to proliferation. However, governments did not supply exporters with a list of dangerous end-users. The Wisconsin Project sought to bridge this knowledge gap and began publishing a newsletter called the Risk Report. 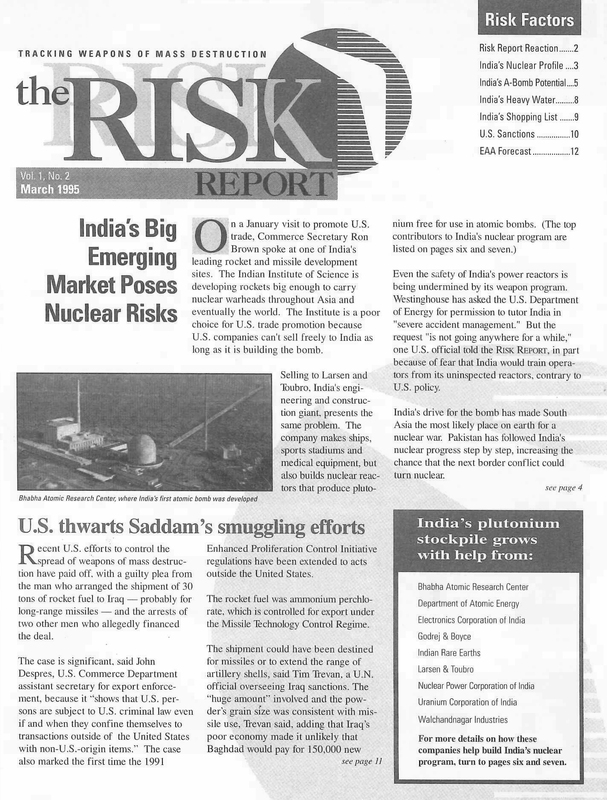 The introductory issue of the Risk Report appeared in 1995. It contained several articles about India’s nuclear program and listed the entities helping to grow the country’s plutonium stockpile. It also described Iraq’s efforts to smuggle missile fuel and successful U.S. efforts to thwart the transfer. The aim of the newsletter was to raise awareness about how WMD programs around the world were being fueled with Western exports, some of which complied with export control laws, and to help exporters avoid such sales so as to “protect their reputations” and “know more about their customers.” Initial funding for the Risk Report was provided by several private foundations. In its over 20 year history, database content has expanded to include not only profiles of entities linked to proliferation and analysis about programs of concern by the Wisconsin Project, but also descriptions of dual-use commodities, strategic trade control regulations, multilateral control lists, and government warning lists and blacklists. Data from the Risk Report is incorporated into a number of company screening systems and government risk management and targeting systems. The Risk Report is the only comprehensive, curated database focused exclusively on proliferation that is used as a tool to manage strategic trade. 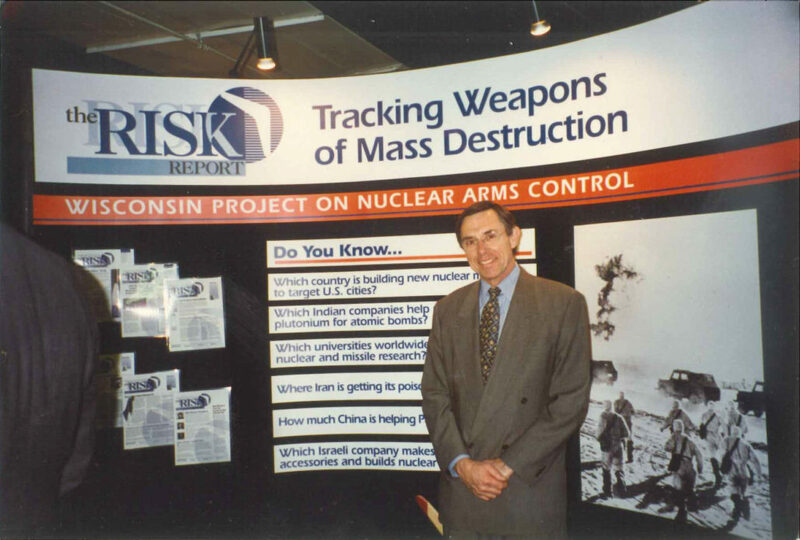 The Wisconsin Project on Nuclear Arms Control carries out research and public education designed to inhibit the spread of nuclear, chemical, and biological weapons and the missiles to deliver them. It is a non-profit, non-partisan 501(c)(3) organization operating in Washington, D.C., founded in 1986 in cooperation with the University of Wisconsin. The Wisconsin Project’s main goal is to reduce the risk that exports will accelerate the proliferation of weapons of mass destruction. The Project helps governments comply with the export restrictions in international agreements, and helps them ensure that their national controls on strategic goods are enforced. The Project also publicizes clandestine transactions in these goods, and draws attention to weaknesses in trade agreements and national laws. Through its research, testimony and publications, the Project has influenced the export policies of major supplier countries. The Wisconsin Project also publishes Iranwatch.org, a comprehensive website that monitors Iran’s nuclear and missile programs. Iranwatch.org contains profiles of hundreds of entities in Iran linked to these programs, as well as their foreign suppliers. In addition, the website contains a large repository of official documents related to Iran and analysis on Iran written by the Project.